Why Share the Gospel in Mercy Ministry? The world is full of very real dangers – violence, poverty, broken relationships, poor health, emotional disturbance, disrupted communities…so many things. All these things can hurt us and we spend our lives trying to avoid them or change them! But none of those things is as dangerous as failure to trust the only One who can provide our permanent hope and security – Jesus Christ. One either has eternal life in Jesus, called the Christ (Savior), or eternal life without Christ. God Himself sends people to be carefully served by us in our ministries and provides the opportunity for us to partner with Him to show people the way to Jesus and eternal LIFE. As a result, the person operates at a terrible disadvantage every day! He or she faces life without a relationship with the God of the Bible — from whom all truth and good comes! He or she faces eternal life separated from God forever. But God provides a remedy for this condition because He loves each person! For those who trust Christ as the One who paid the full penalty for sin, God gives the gift of eternal LIFE in relationship with Himself. No one earns it. God gives it once and for all! Eternal life includes all the work of God’s grace day by day, to help the person who has been made new – no longer estranged from God but now adopted by God into His family. This eternal life gift extends out through all of life on earth as the Holy Spirit gives strength to a believer to resist sin and choose truth. He provides comfort, teaching, and power as Christ continues to intercede for the believer, all the way into joyful eternity. Prepare to help a new Christian to grow in their faith, to learn to pray, to become established in their understanding of Scripture — in short, help them find a home in a church that loves new believers and knows how to help them grow in their spiritual life. Pray that God will cause you and partners in your ministry to think of others first and share the gospel. Be one of those “lighted billboard” people that God will use to both LIVE the gospel through your ministry, and SAY the gospel so it can be heard by a person who does not know Him. Learn more here: Online evangelism training is available through EvanTell, 24/7, Free Online Evangelism Training. 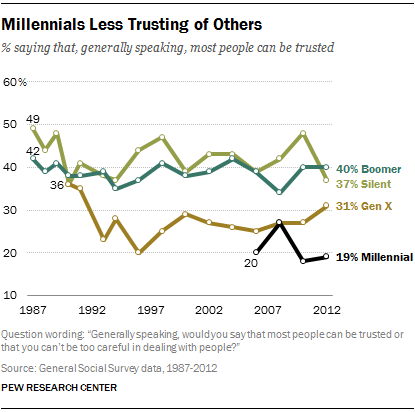 Adult members of the Millennial Generation have the lowest level of trust among all generations in America. Only 19% of them felt that people generally could be trusted. In their recent review of social trends, Pew Research offered this chart, Millennials Less Trusting of Others, which has implications for us as we try to Make the God Connection with anyone. Remember Who’s in Charge! This is not always easy. Just pray for an opportunity to share the gospel. Honor the Lord by learning to share the gospel clearly and simply with Biblical accuracy. Then do the best you can to declare the gospel, with personal authenticity, in the context of a person’s current situation that they have revealed to you. The Holy Spirit is in charge of whether or not the person trusts Christ. So that’s good news. Relax. Recognize that trusting may be really tough. Your clients often have had a rough life and people around them may not be trustworthy at all! This is why your demeanor of grace and the center’s integrity and care for a person may be so novel that she will later say to you, “You were so nice. You guys really cared about me! That’s why I came back.” If she can trust you, that’s a good start! Be ready for questions and, if you don’t know an answer, say so, and tell her you’ll get back to her. Gospel conversations are not abrupt! You just can’t leap into the gospel from a conversation about unplanned pregnancy without first touching on some spiritual topic. Sometimes, I ask a person, “Who or what do you rely on when times are hard?” Maybe they know more about trust than you think! Their answer often tells something about whether they have any spiritual beliefs. If you have a smart phone or iPad, you can link to EvanTell’s mobile site on which there is a video of the gospel presentation that you and she can view together! Just get on your mobile device and key in http://www.evantell.org and the mobile site will come up with the gospel presentation on it! If a person trusts Christ alone for her salvation, there’s wonderful opportunity to help her know what to do next to grow in her faith. We will be posting on “3 Crucial Steps for New Believers” next week!